We are engaged in offering a comprehensive range of Oxygen Humidifier Bottles. 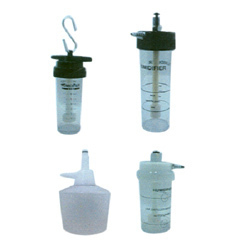 These bottles are available with hook for suitable hanging on the cylinder or flow meter unit. Our clients can avail these bottles in different types such as screw on type, nebulizer bottle, and nut on type. Looking for Humidifier Bottles ?